"My first priority is to serve God and neighbor as a parish priest - this is full time work! However, for recreation I love the outdoors - hiking, biking, canoeing. These things I like to do with my many family members. I have a great devotion to the Sacred Heart of Jesus and to the Blessed Virgin Mary." A native of rural Northwest Ohio, Father Adam is proud to be one of eight children. After completing his Bachelor of Arts at the Franciscan University of Steubenville in 1997, he formally began his studies for the priesthood and was ordained in 2002. 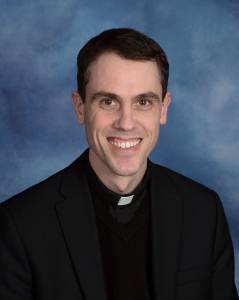 In addition to his assignment at St. Joan of Arc, he was named Chaplain/Presbyteral Moderator of St. Richard in July 2012.